We always advocate for eating your veggies here at Get Healthy U; they’re low calorie, full of vitamins and are incredibly versatile in recipes! And today, we want to highlight one of the most amazing vegetables and a team favorite: Beets! Now, when you hear me say “beet”, you may think of the full tub of watery, pinkish slices at the salad bar no one touches, but that is a very sad picture for this amazing vegetable! In fact, beets are one of the most delicious ingredients you can add to salads, smoothies, sandwiches and more! So why are we so obsessed with this powerful superfood? Not to mention the taste, which we’d describe to be sweet and earthy, the nutritional benefits are incredibly expansive. Oftentimes, the saturation of color in a vegetable means that it’s incredibly nutrient rich. This holds true for beets. Beets are known for their bright red color (present from their betacyanin pigment), but there are also golden varieties (present from their betaxanthin pigment). Whether eaten whole or juiced, here are 9 of their amazing benefits! Beets naturally detoxify the body due to a group phytonutrients called betalains. This allows them to remove unwanted toxins, purify your blood, skin, kidneys and liver. They are nutrient-rich and low calorie. Beets are loaded with many nutrients including but not limited to potassium—442 milligrams per cup to be exact— folate (or vitamin B9), manganese, magnesium and vitamin C while still being low in calories—only 37 per half cup. Beets naturally contain nitrates which the body turns into a gas known as nitric oxide. Nitric oxide then prevents blood from thickening and clotting as well as relaxing and dilating your blood vessels, thus lowering blood pressure. 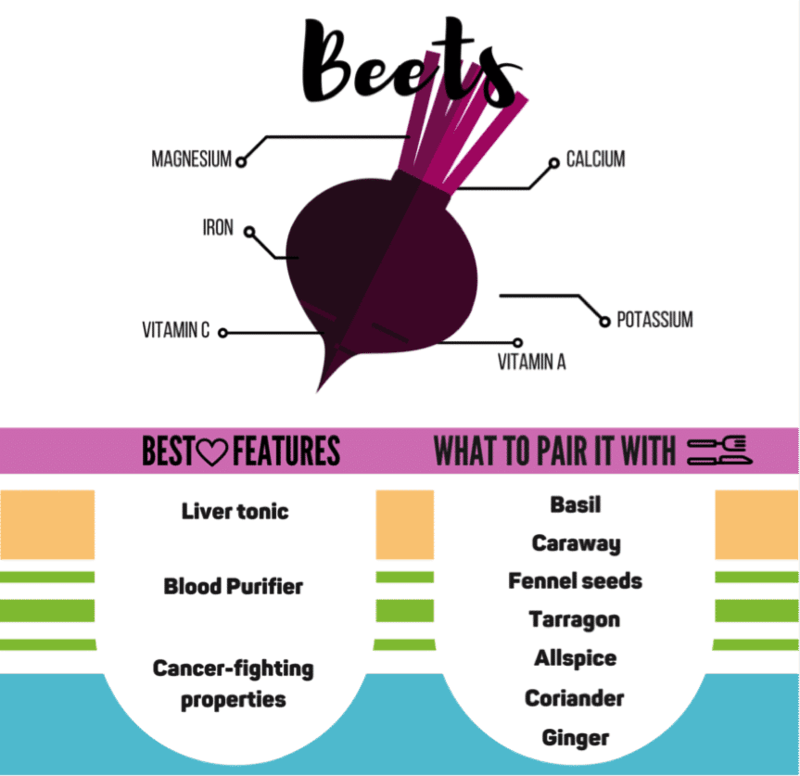 Beets are also touted to be able to fight heart disease as they are the highest plant based source of betaine which lower C-reactive protein levels often linked to heart disease. The same phytonutrients responsible for the color of beets are also the same ones we can look to for their anti-cancer properties. Beets can increase oxygen in the blood by 400 percent and rid the body of toxins which helps to kill cancer cells. Because of the presence of betacyanin, beet have actually been proven to increase an indiviual’s exercise endurance. So before you head to gym, think about incorporating beets into your morning meal and you may just be able to push yourself harder and up to 16 percent longer. Beets contain several compounds that are shown to reduce inflammation in the body including betaine, isobetain and vulgaxanthin. They are good for “that time of month”. Because beets contain iron, they are particularly good for women as it can help replenish iron lost during their menstrual cycle. Beets are a great choice for pregnant women as eating beets can reduce the risk of birth defects in your baby due to the presence of folic acid used in the development of a baby’s spinal column. Ready to try working beets into your diet? Here are 11 amazing recipes that make beets shine both in terms of health benefits and presentation. I mean c’mon, who doesn’t want to dive into these gorgeous recipes?! Beets are great for juicing and adding to smoothies, not only for the vibrant color that they give, but also for their detoxifying properties. This coconut and raw beet smoothie is definitely one to try. This is one of our favorite salads when we’re looking for a light and refreshing taste, but need something to fill us up. It makes a great side dish or weekday lunch and is super easy to throw together. We’ll make a batch of quinoa and roast beets over the weekend to make the prep even easier during the week! This Stacked Beet Salad recipe with crispy shallots and herb infused oil is truly delicious and is a great way to shake up beets for even non-beet lovers. The herb infused oil dressing makes this healthy dish something really special. Beets, berries, protein powder and almond milk make up the main ingredients for this awesome and super pretty smoothie bowl. 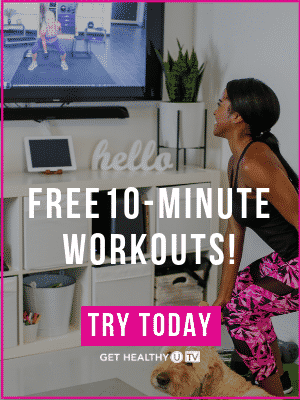 It’s great post-workout or as a breakfast treat! Make a healthy desk lunch with this watercress, avocado and beet salad topped with lentil and a dijon maple dressing. It’s a great source of vitamins and minerals plus protein and fiber. Chris is obsessed with beet burgers and considers herself as somewhat of an expert since she’s tried so many. This recipe was made in her own kitchen by combining all the things she loves in several different ones she tried. Plus, the chipotle aioli on this is good enough as a standalone dip! Fruity and refreshing, this delicious smoothie pairs raspberries and beets together for the most pretty drink. This recipe uses a superfood powder that supports balanced blood sugar, energy and mental clarity, but you can add any of your favorite nutritional powders. You didn’t think we’d get to the bottom of this list without showcasing a spiralized recipe, did you? Good. Because of course, we had to include this spiralized beet salad filled with delicious ingredients like cucumber, mint and feta plus it’s finished off with a delightful vinaigrette and crunchy walnuts. We’re pretty sure that if you make these yogurt breakfast bowls for your family, they’ll be diving in before you even tell them what it is! Aren’t they simply gorgeous? Made with beets, honey, cardomon, Greek yogurt and granola, we’re pretty sure this is our new favorite breakfast. Put a fun and pretty spin on hummus with this beetroot recipe. It makes for a beautiful dip that’s not only beautiful but also healthy and yummy! Fries are one of this things we prefer to make on our own and this recipe for garlic roasted root vegetable fries is one we like to return to. Our favorite veggies for this recipe is of course, beets, but also parsnips and carrots! One of the simplest and most delicious ways to prepare beets are to roast them. Simply set your washed and scrubbed beets on foil on a baking sheet. Drizzle with olive oil and salt; then cover with foil and crimp the edges. Bake at 350 for 45 minutes. When we don’t have time for the above method of roasting beets, we love the brand “Love Beets”. Already prepared, just pick them up at the grocery store and toss into a salad or add to a recipe. Want to receive all the health benefits of beets without a lot of fuss? Then juicing might be the way to go! One of our most favorite juicing recipes includes beets, carrots and apples. Beets make a great alternative to artificial food dyes! Anyone who has dealt with cooked beets with their fingers knows exactly what I’m talking about. It’s simple too with this boiling method. Don’t discard the greens of the beet! Beet greens contain even more nutrients including calcium, iron, vitamin A, K and C.
These beets are the most common food in my house! I love making salad or soup with them! Thanks so much for sharing these recipes. I'll try out and make something new for my family!